8e étage, Salle Jean-Pierre Vernant. 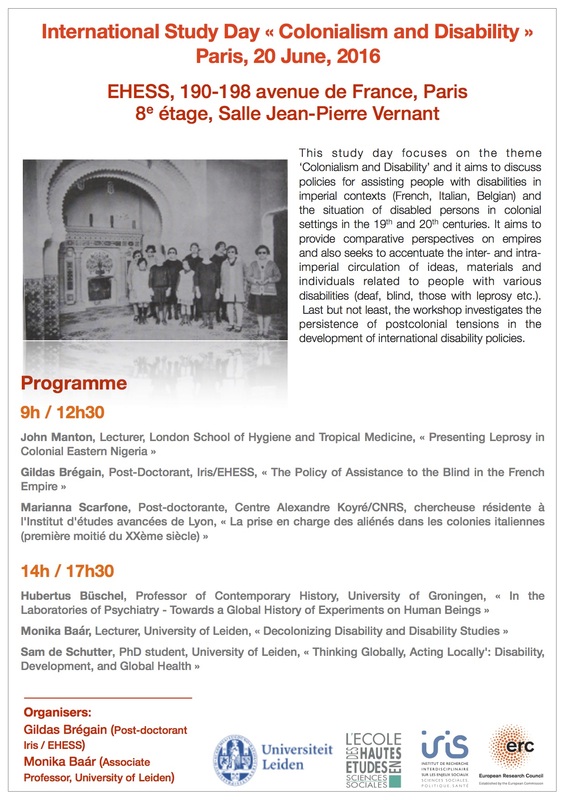 This study day focuses on the theme ‘Colonialism and Disability’ and it aims to discuss policies for assisting people with disabilities in imperial contexts (French, Italian, Belgian) and the situation of disabled persons in colonial settings in the 19th and 20th centuries. It aims to provide comparative perspectives on empires and also seeks to accentuate the inter- and intra-imperial circulation of ideas, materials and individuals related to people with various disabilities (deaf, blind, those with leprosy etc.). Last but not least, the workshop investigates the persistence of postcolonial tensions in the development of international disability policies. John Manton, Lecturer, London School of Hygiene and Tropical Medicine. « Presenting Leprosy in Colonial Eastern Nigeria». Gildas Brégain, Post-Doctorant à l'Iris/EHESS. « The Policy of Assistance to the Blind in the French Empire». Marianna Scarfone, Post-doctorante au Centre Alexandre Koyré-CNRS, chercheuse résidente à l'Institut d'Etudes Avancées de Lyon, «La prise en charge des aliénés dans les colonies italiennes (première moitié du XXème siècle) ». Hubertus Büschel, Professor of Contemporary History at University of Groningen. « In the Laboratories of Psychiatry - Towards a Global Historyof Experiments on Human Beings ». Monika Baár. Lecturer at the University of Leiden. « Decolonizing Disability and Disability Studies». Sam de Schutter, PhD student, University of Leiden. « Thinking Globally, Acting Locally': Disability,Development, and Global Health ». Organisers: Gildas Brégain (Post-doctorant Iris, EHESS), Monika Baár (Associate Professor, University of Leiden).